Anti-vascular endothelial growth factor (VEGF) therapy is the treatment of choice for cases with neovascular age-related macular degeneration (AMD). Switching to an alternate anti-VEGF has been suggested as a possible option for resistant cases. The purpose of this review is to evaluate whether the timing of switching affects treatment outcomes. A review of published literature was performed looking at all studies where patients with refractory neovascular AMD were switched to an alternative anti-VEGF. Studies were then stratified based on the timing of switching into early (< 12 previous injections) and late (> 12 previous injections). A total of 38 studies were identified: 18 where patients were switched early and 20 where they were switched late. Both subgroups showed anatomic improvement after switching, with limited visual gains. There are insufficient data to recommend early versus late switching. However, both groups showed a reduction of fluid on optical coherence tomography and visual gains in 25% to 30% of patients. However, in clinical practice, many physicians switch anti-VEGF treatments when patients do not show adequate anatomic and/or visual improvements. In fact, a 2016 Preferences and Trends survey for the American Society of Retinal Specialists found that 77% of those surveyed would switch to an alternative anti-VEGF drug in non-responding cases after three to six injections, 12% would switch after fewer than three injections, and 12.5% would switch after more than six injections. Interestingly, although 59% of U.S. retina specialists believed in the efficacy of switching therapies, the remaining 41% were either not sure about this benefit or preferred to not switch drugs. One of the major issues with regard to switching anti-VEGF drugs is the lack of adequate controlled studies comparing between patients who were treated with a single drug and those treated with different drugs. In addition, there are no studies comparing between switching therapies early in the course of treatment versus switching therapies in a more chronic stage of the disease. The current review looks specifically at the timing of switching in various studies and whether this had an effect on treatment outcomes. The search strategy included searches in Medline, PubMed, and Embase and included the search items “age-related macular degeneration,” “neovascular AMD,” “aflibercept,” “ranibizumab,” “bevacizumab,” “anti-VEGF,” “switch,” “conversion,” “change,” “refractory,” “recalcitrant,” “nonresponders.” and “resistant.” This review only included all published literature prior to August 2016 and studies that switched patients who were refractory to previous anti-VEGF therapy, had a clear definition of refractoriness or nonresponse, had an adequate number of patients (> 10 patients), had an adequate follow-up duration (> 3 months), and were published in English. A total of 38 studies met these criteria. The exact definition of switching early or late in the course of treatment has not been previously defined for AMD. The post hoc analysis of several RCTs had identified a group of delayed responders (13% to 15%), with a peak response at 12 months after therapy initiation and further stabilization in the following 24 months of the study.3,4 Therefore, for the purpose of this review, early switching was defined as patients who received less than 12 injections in the course of treatment compared to chronic patients who received more than 12 injections. This cut-off point was chosen to separate the effect of a delayed response of treatment in general from the effect of switching to a new anti-VEGF. Switching to Ranibizumab: A total of three studies looked at the effects of switching to ranibizumab in nonresponsive cases. In a retrospective study by Waizel et al., 19 patients treated with aflibercept were switched early to bevacizumab after a mean of 6.5 injections.9 Although there was no significant change in vision (P = .84), the CRT improved from 367 μm (SD: 198 μm) to 335 μm (SD: 184 μm) (P = .0065) after a mean of 5.4 bevacizumab injections. These results should, however, be interpreted cautiously because there are no other studies looking at switching from aflibercept to another anti-VEGF. In the retrospective studies by Chatziralli et al., Arcinue et al., Heussen et al., and Griffin et al., no significant improvements in VA after switching to aflibercept were demontrated.13–16 A study by Ricci et al. 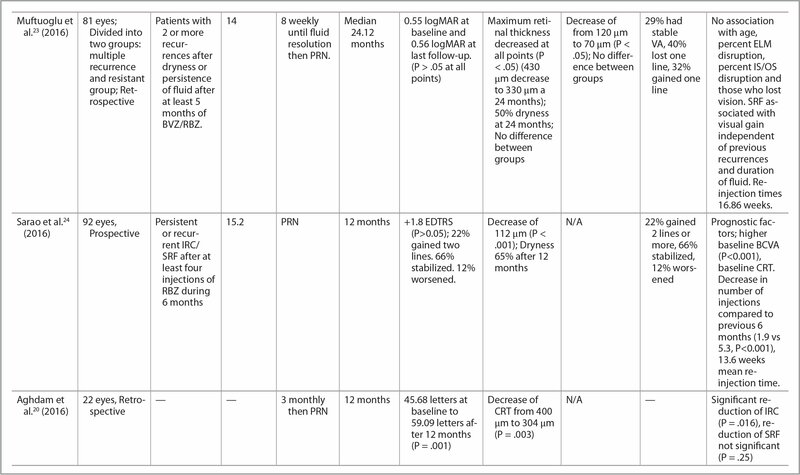 compared between two switching regimens in cases nonresponsive to ranibizumab: pro re nata (PRN) and fixed bimonthly.17 Although the PRN group did not show any improvements in vision (P = .33), the fixed bimonthly group showed a statistically significant visual improvement of +3 ETDRS letters after 12 months of follow up (P = .008). In addition, only 8% to 25% of patients lost five to 15 letters, with no significant difference between the PRN and fixed regimen groups. The study by Chan et al. also showed a significant improvement in VA of + 4 letters at 6 months after switching (P < .001) but did not find significant differences between patients who were switched from either ranibizumab or bevacizumab to aflibercept.18 Overall, 30% to 40% of patients gained some VA compared to 30% to 55% of patients who showed visual stability without loss of vision. A relatively small percentage of patients (10% to 25%) lost vision after switching. All the retrospective studies looking at switching from other anti-VEGF therapies to aflibercept showed statistically significant decreases in CRT at the end of follow up.13–18 In the study by Ricci et al., 58% of patients treated with PRN aflibercept and 42% of patients treated in the fixed bimonthly regimen group achieved fluid resolution.17 In the study by Chan et al., all optical coherence tomography parameters (subretinal fluid [SRF] height, PED height, and central macular thickness) significantly improved after switching to aflibercept (P < .001).18 Furthermore, there was no difference in the outcomes of switching to aflibercept regardless of the primary drug (bevacizumab or ranibizumab). 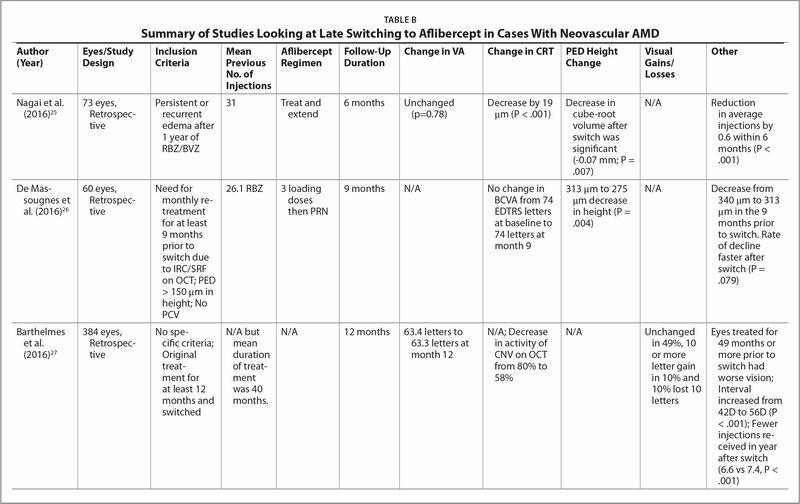 The current review included 20 studies in which patients had received more than 12 previous injections prior to switching (16 retrospective and four prospective) (Table B). These studies included only late switching to aflibercept with no studies being identified where patients were switched late to ranibizumab or bevacizumab. A prospective study by Mantel et al. compared patients who, after a mean of 21 injections of ranibizumab with inadequate response, were divided into two groups: a group who continued receiving ranibizumab and a group who was switched to aflibercept.23 This study revealed that there was no significant difference in visual improvements between the two groups (aflibercept group: + two ETDRS letters; ranibizumab group: +0.5 ETDRS letters; P = .07). Based on the review of literature, it is clear that switching, whether early or late, was associated with anatomic improvement, with resolution of both SRF and IRC. There have been two previous review articles that have looked into the effects of switching anti-VEGF drugs in the treatment of AMD.33, 34 None stratified patients based on the timing of switching and included only studies prior to May 2015 (the present study included studies until August 2016). The anatomic improvement was not accompanied by a statistically significant visual improvement at the end of follow-up in the majority of studies.39 The reason for this discrepancy between VA and anatomy might be explained by the inherent pathology of resistant cases that may be associated with more damage to the photoreceptors. Another possibility is the lack of nonprotocol refractions during the studies' assessments, which negated any visual improvement. However, further scrutiny of the switch studies demonstrated that 20% to 25% of patients switched did have visual improvements, and approximately 40% to 50% showed visual stability. The studies also demonstrated that only a small percentage of patients (10% to 15%) had visual loss (Tables A and B). One of the challenges of the current review was to define the cut-off point for early versus late switching. 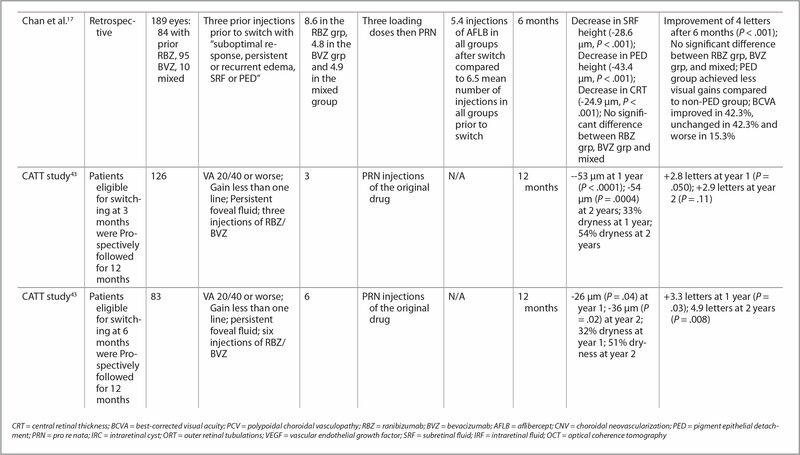 The cut-off point of 12 injections might seem controversial, but it was chosen in light of data regarding delayed-responders.2,35 Based on data from previous post hoc analysis and from the current review, it can be suggested that patients who fail to respond may fall into one of three categories: early responders who show an increased resistance to therapy over time (tachyphylaxis), delayed responders, and those who fail to respond at all to therapy from the start (resistance).2,3,35,36 These data also highlight the importance of evaluating switching at different time points to study its effect on each patient category. A significant drawback of reviewing data regarding switching anti-VEGF agents is that most of the available studies are retrospective or small prospective reports without control groups. Without adequately designed RCTs comparing the switched patients to a control (unswitched) group, it is difficult to ascertain whether switching itself is effective or whether patients responded because they received standardized timely therapy and/or they are simply delayed responders. 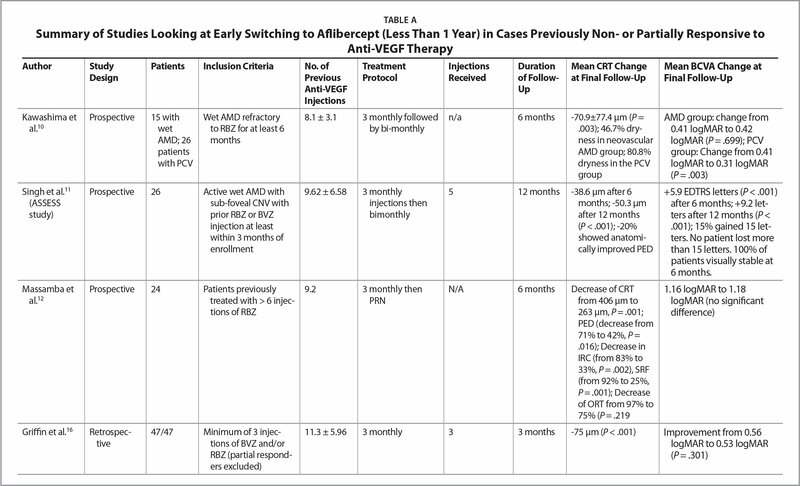 More prospective studies comparing outcomes of early and late switching with clear definitions for each time point are required to help guide current treatment practice and determine the efficacy of switching anti-VEGF therapies. Martin DF, Maguire MG, CATT Research Group et al. Ranibizumab and bevacizumab for neovascular age-related macular degeneration. N Engl J Med. 2011;364(20):1897–1908. Stoller GL, Kokame GT, Dreyer RF, Shapiro H, Tuomi LL. Patterns of early and delayed visual response to ranibizumab treatment for neovascular age-related macular degeneration. JAMA Ophthalmol. 2016;134(5):545–553. Gale R, Korobelnik JF, Yang Y, Wong TY. Characteristics and predictors of early and delayed responders to ranibizumab treatment in neovascular age-related macular degeneration: A retrospective analysis from the ANCHOR, MARINA, HARBOR, and CATT Trials. Ophthalmologica. 2016;236(4):193–200. Moisseiev E, Katz G, Moisseiev J, et al. Switching treatment for neovascular age-related macular degeneration from bevacizumab to ranibizumab: Who is likely to benefit from the switch?Retina. 2015;35(7):1323–1330. Ehlken C, Jungmann S, Böhringer D, Agostini HT, Junker B, Pielen A. Switch of anti-VEGF agents is an option for nonresponders in the treatment of AMD. Eye (Lond). 2014;28(5):538–545. Küçükerdönmez C, Gelisken F, Yoeruek E, Bartz-Schmidt KU, Leitritz MA. Switching intravitreal anti-VEGF treatment in neovascular age-related macular degeneration. Eur J Ophthalmol. 2014;25(1):51–56. Pinheiro-Costa J, Freitas-da-Costa P, Falcão MS, Brandão EM, Falcão-Reis F, Carneiro AM. Switch from intravitreal ranibizumab to bevacizumab for the treatment of neovascular age-related macular degeneration: Clinical comparison. Ophthalmologica. 2014;232(3):149–155. Waizel M, Kazerounian S, Rickmann A, Wolf K, Blanke BR, Todorova MG. Response to bevacizumab after treatment with aflibercept in eyes with neovascular AMD. Eur J Ophthalmol. 2016;26(5):e139–e140. Kawashima Y, Oishi A, Tsujikawa A, et al. Effects of aflibercept for ranibizumab-resistant neovascular age-related macular degeneration and polypoidal choroidal vasculopathy. Graefes Arch Clin Exp Ophthalmol. 2015;253(9):1471–1477. Singh RP, Srivastava SK, Ehlers JP, et al. 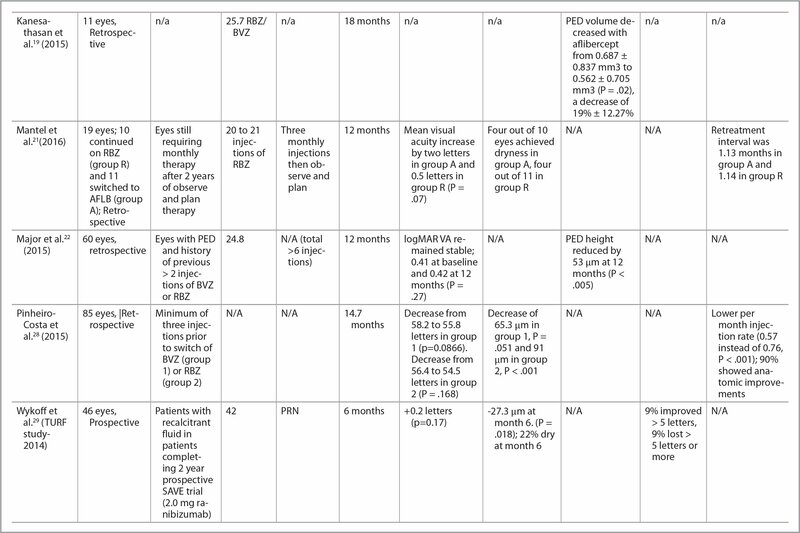 A single-arm, investigator-initiated study of the efficacy, safety, and tolerability of intravitreal aflibercept injection in subjects with exudative age-related macular degeneration previously treated with ranibizumab or bevacizumab (ASSESS study): 12-month analysis. Clin Ophthalmol. 2015;9:1759–1766. Massamba N, Dirani A, Butel N, et al. Evaluation of outer retinal tubulations in eyes switched from intravitreal ranibizumab to aflibercept for treatment of exudative age-related macular degeneration. Graefes Arch Clin Exp Ophthalmol. 2017;255(1):61–67. Chatziralli I, Nicholson L, Vrizidou E, et al. Predictors of outcome in patients with neovascular age-related macular degeneration switched from ranibizumab to 8-weekly aflibercept. Ophthalmology. 2016;123(8):1762–1770. Arcinue CA, Ma F, Barteselli G, Sharpsten L, Gomez ML, Freeman WR. One-year outcomes of aflibercept in recurrent or persistent neovascular age-related macular degeneration. Am J Ophthalmol. 2015;159(3):426–436. Heussen FM, Shao Q, Ouyang Y, Joussen AM, Müller B. Clinical outcomes after switching treatment from intravitreal ranibizumab to aflibercept in neovascular age-related macular degeneration. Graefes Arch Clin Exp Ophthalmol. 2014;252(6):909–915. Griffin DR, Richmond PP, Olson JC. Intravitreal aflibercept outcomes in patients with persistent macular exudate previously treated with bevacizumab and/or ranibizumab for neovascular age-related macular degeneration. J Ophthalmol. 2014;2014:497178. Ricci F, Parravano M, Regine F, et al. Aflibercept in persistent neovascular AMD: Comparison of different treatment strategies in switching therapy. Eye (Lond). 2016;30(8):1077–1083. Chan CK, Jain A, Sadda S, Varshney N, et al. Optical coherence tomographic and visual results at six months after transitioning to aflibercept for patients on prior ranibizumab or bevacizumab treatment for exudative age-related macular degeneration (an American Ophthalmological Society thesis). Trans Am Ophthalmol Soc. 2014;112:160–198. de Massougnes S, Dirani A, Ambresin A, Decugis D, Marchionno L, Mantel I. Pigment epithelial detachment response to aflibercept in neovascular age-related macular degeneration refractory to ranibizumab: Time course and drug effects. Retina. 2016;36(5):881–888. Major JC Jr., Wykoff CC, Croft DE, et al. Aflibercept for pigment epithelial detachment for previously treated neovascular age-related macular degeneration. Can J Ophthalmol. 2015;50(5):373–377. Grewal DS, Gill MK, Sarezky D, Lyon AT, Mirza RG. Visual and anatomical outcomes following intravitreal aflibercept in eyes with recalcitrant neovascular age-related macular degeneration: 12-month results. Eye (Lond). 2014;28(7):895–899. Gharbiya M, Iannetti L, Parisi F, De Vico U, Mungo ML, Marenco M. Visual and anatomical outcomes of intravitreal aflibercept for treatment-resistant neovascular age-related macular degeneration. Biomed Res Int. 2014;2014:273754. Muftuoglu IK, Arcinue CA, Tsai FF, et al. Long-term results of pro re nata regimen of aflibercept treatment in persistent neovascular age-related macular degeneration. Am J Ophthalmol. 2016;167:1–9. Mantel I, Gianniou C, Dirani A. Conversion to aflibercept therapy versus continuing with ranibizumab therapy for neovascular age-related macular degeneration dependent on monthly ranibizumab treatment. Retina. 2016;36(1):53–58. Pinheiro-Costa J, Costa JM, Beato JN, et al. Switch to aflibercept in the treatment of neovascular AMD: One-year results in clinical practice. Ophthalmologica. 2015;233(3–4):155–161. Wykoff CC, Brown DM, Maldonado ME, Croft DE. Aflibercept treatment for patients with exudative age-related macular degeneration who were incomplete responders to multiple ranibizumab injections (TURF trial). Br J Ophthalmol. 2014;98(7):951–955. Barthelmes D, Campain A, Nguyen P, et al. Effects of switching from ranibizumab to aflibercept in eyes with exudative age-related macular degeneration. Br J Ophthalmol. 2016;100(12):1640–1645. Gharbiya M, Malagola R, Mariotti C, et al. Spectral-domain optical coherence tomography analysis of persistent subretinal fluid after scleral buckling surgery for macula-off retinal detachment. Eye (Lond). 2015;29(9):1186–1193. Abri Aghdam K, Seidensticker F, Pielen A, Framme C, Junker B. The short-term effects of aflibercept on the size of choroidal neovascularization lesion in treatment-resistant neovascular age-related macular degeneration as determined by spectral-domain optical coherence tomography. Lasers Surg Med. 2016;48(7):668–677. Kumar N, Marsiglia M, Mrejen S, et al. Visual and anatomical outcomes of intravitreal aflibercept in eyes with persistent subfoveal fluid despite previous treatments with ranibizumab in patients with neovascular age-related macular degeneration. Retina. 2013;33(8):1605–1612. Thorell MR, Nunes RP, Chen GW, et al. Response to aflibercept after frequent re-treatment with bevacizumab or ranibizumab in eyes with neovascular AMD. Ophthalmic Surg Lasers Imaging Retina. 2014;45(6):526–533. Messenger WB, Campbell JP, Faridi A, et al. Injection frequency and anatomic outcomes 1 year following conversion to aflibercept in patients with neovascular age-related macular degeneration. Br J Ophthalmol. 2014;98(9):1205–1207. Sarao V, Parravano M, Veritti D, et al. Intravitreal aflibercept for choroidal neovascularization due to age-related macular degeneration unresponsive to ranibizumab therapy. Retina. 2016;36(4):770–777. Lazzeri S, Ripandelli G, Sartini MS, et al. Aflibercept administration in neovascular age-related macular degeneration refractory to previous anti-vascular endothelial growth factor drugs: A critical review and new possible approaches to move forward. Angiogenesis. 2015;18(4):397–432. Seguin-Greenstein S, Lightman S, Tomkins-Netzer O. A meta-analysis of studies evaluating visual and anatomical outcomes in patients with treatment resistant neovascular age-related macular degeneration following switching to treatment with aflibercept. J Ophthalmol. 2016;2016:4095852. Ying GS, Maguire MG, Daniel E, et al. Association of baseline characteristics and early vision response with 2-year vision outcomes in the Comparison of AMD Treatments Trials (CATT). Ophthalmology. 2015;122(12):2523–2531.e1. Forooghian F, Cukras C, Meyerle CB, Chew EY, Wong WT. Tachyphylaxis after intravitreal bevacizumab for exudative age-related macular degeneration. Retina. 2009;29(6):723–731. Singh RP, Srivastava S, Ehlers JP, Bedi R, Schachat AP, Kaiser PK. A single-arm, investigator-initiated study of the efficacy, safety and tolerability of intravitreal aflibercept injection in subjects with exudative age-related macular degeneration, previously treated with ranibizumab or bevacizumab: 6-month interim analysis. Br J Ophthalmol. 2014;98Suppl 1:i22–27. 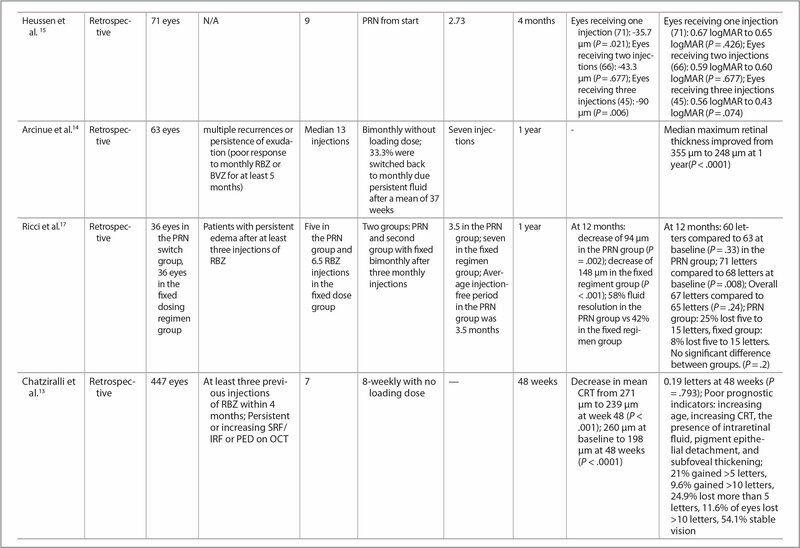 Singh et al.11 (ASSESS study) Prospective 26 Active wet AMD with sub-foveal CNV with prior RBZ or BVZ injection at least within 3 months of enrollment 9.62 ± 6.58 3 monthly injections then bimonthly 5 12 months −38.6 μm after 6 months; −50.3 μm after 12 months (P < .001); −20% showed anatomically improved PED +5.9 EDTRS letters (P < .001) after 6 months; +9.2 letters after 12 months (P < .001); 15% gained 15 letters. No patient lost more than 15 letters. 100% of patients visually stable at 6 months. 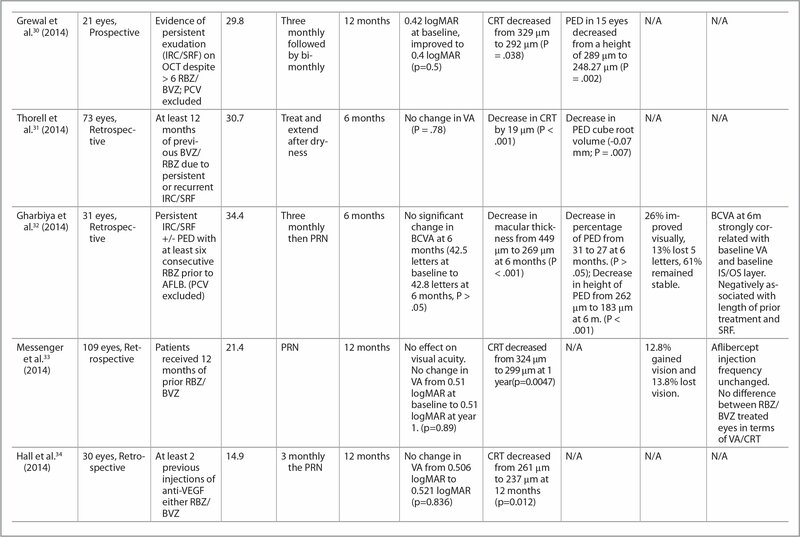 Muftuoglu et al.23 (2016) 81 eyes; Divided into two groups: multiple recurrence and resistant group; Retrospective Patients with 2 or more recurrences after dryness or persistence of fluid after at least 5 months of BVZ/RBZ. 14 8 weekly until fluid resolution then PRN. Median 24.12 months 0.55 logMAR at baseline and 0.56 logMAR at last follow-up. (P > .05 at all points) Maximum retinal thickness decreased at all points (P < .05) (430 μm decrease to 330 μm a 24 months); 50% dryness at 24 months; No difference between groups Decrease of from 120 μm to 70 μm (P < .05); No difference between groups 29% had stable VA, 40% lost one line, 32% gained one line No association with age, percent ELM disruption, percent IS/OS disruption and those who lost vision. SRF associated with visual gain independent of previous recurrences and duration of fluid. Re-injection times 16.86 weeks. Sarao et al.24 (2016) 92 eyes, Prospective Persistent or recurrent IRC/SRF after at least four injections of RBZ during 6 months 15.2 PRN 12 months +1.8 EDTRS (P>0.05); 22% gained two lines. 66% stabilized. 12% worsened. Decrease of 112 μm (P < .001); Dryness 65% after 12 months N/A 22% gained 2 lines or more, 66% stabilized, 12% worsened Prognostic factors; higher baseline BCVA (P<0.001), baseline CRT. Decrease in number of injections compared to previous 6 months (1.9 vs 5.3, P<0.001), 13.6 weeks mean re-injection time. Gharbiya et al.32 (2014) 31 eyes, Retrospective Persistent IRC/SRF +/− PED with at least six consecutive RBZ prior to AFLB. 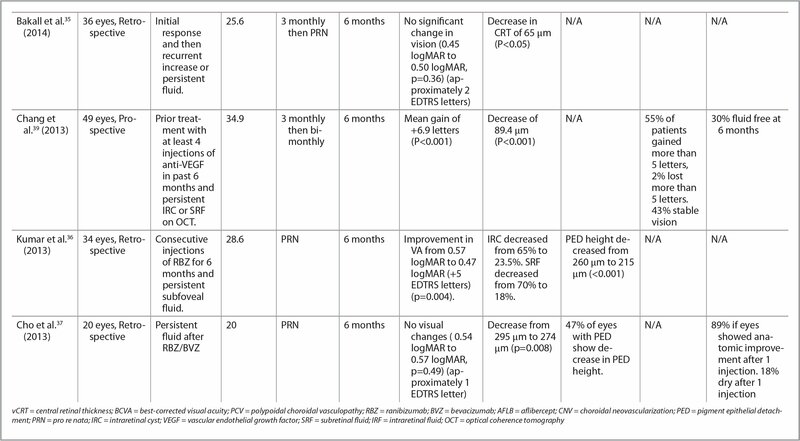 (PCV excluded) 34.4 Three monthly then PRN 6 months No significant change in BCVA at 6 months (42.5 letters at baseline to 42.8 letters at 6 months, P > .05) Decrease in macular thickness from 449 μm to 269 μm at 6 months (P < .001) Decrease in percentage of PED from 31 to 27 at 6 months. (P > .05); Decrease in height of PED from 262 μm to 183 μm at 6 m. (P < .001) 26% improved visually, 13% lost 5 letters, 61% remained stable. BCVA at 6m strongly correlated with baseline VA and baseline IS/OS layer. Negatively associated with length of prior treatment and SRF. From the Ophthalmology Department, Alexandria Faculty of Medicine, Alexandria, Egypt (MA); Ophthalmic Research Center and Faculty of Medicine, Mashhad University of Medical Sciences, Mashhad, Iran (TB); and Cleveland Clinic Cole Eye Institute, Cleveland (TB, FOS, RPS). Dr. Singh reports grants and personal fees from Regeneron, Genentech, and Novartis; and personal fees from Optos and Zeiss. The remaining authors report no relevant financial disclosures. Dr. Singh did not participate in the editorial review of this manuscript. Support for this study was provided by an unrestricted grant from Research to Prevent Blindness. The sponsor did not participate in the design, execution, data review, or publishing of this manuscript. Address correspondence to Rishi P. Singh, MD, 9500 Euclid Avenue, Desk i32, Cleveland, OH 44195; email: SINGHR@ccf.org.